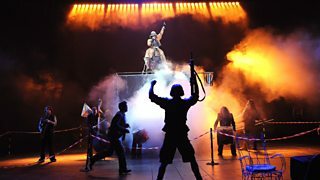 Why is Brecht so important? Bertolt Brecht was a theatre practitioner. He made and shaped theatre in a way that had a huge impact upon its development. Many of his ideas were so revolutionary that they changed the theatrical landscape forever. Modern theatre owes a lot to his methods. When naturalistic theatre was at its height and acted as a mirror to what was happening in society, he decided to use it as a force for change. He wanted to make his audience think and famously said that theatre audiences at that time “hang up their brains with their hats in the cloakroom”. or dramatic theatre the audience care about the lives of the characters onstage. They forget their own lives for a while and escape into the lives of others. When an audience cries for a character or feels emotion through the events happening to them it’s called catharsis. Brecht was against cathartic theatre. He believed that while the audience believed in the action onstage and became emotionally involved they lost the ability to think and to judge. He wanted his audiences to remain objective and distant from emotional involvement so that they could make considered and rational judgements about any social comment or issues in his work. To do this he used a range of theatrical devices or techniques so that the audience were reminded throughout that they were watching theatre; a presentation of life, not real life itself. His kind of theatre was called Epic theatre. He called the act of distancing the audience from emotional involvement the verfremdungseffekt.